Two handed chords are great for comping behind a soloist. If you are advanced enough you can even play melodies with two hands by making the melody note the same as the top note of your chord. The easiest way to play two handed chords is through the use of upper structure triads. This just means that your left hand plays a simple shell voicing or even just the guide tones (third and seventh) and your right hand plays a triad that contains colorful notes. 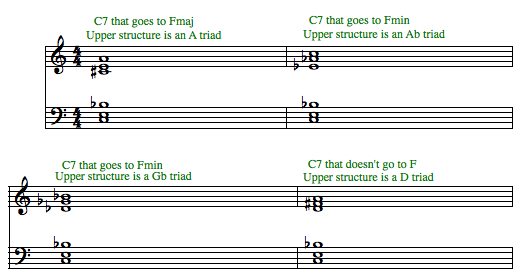 It is possible to use minor, diminished, and augmented triads but I am going to stick to major triads here because they have the strongest sound. If the maj7 is the key of the song, aka the Imaj7 chord, then you can play a shell voicing in the left and a major triad in the right built off the fifth note of the chord. So on a Cmaj7, you play a G triad in your right hand. If the maj7 is not the key of the song, aka a IVmaj7 or bIImaj7, bVImaj7, etc... then you can play the triad off the fifth or the second note which gives you a beautiful sharp 11. Here are some examples from the key of C.
Min7 chords are pretty easy, just play a shell in the left and play a major triad built from the flat seven or flat three. Now you have options. Make sure you understand the three types of dominant 7th chords. Here are the appropriate upper structure triads- If the V7 proceeds down a fifth to a major chord, play a triad built off the sixth note. If the V7 proceeds down a fifth to a minor chord, play a triad built off the flat sixth note or the flat fifth. If the dominant 7 chord is not a V chord, but is a substitute dominant or just some other type like bIV7 or IV7, you can play a triad built off the second note. Here are some examples. Now in all these examples I am playing the root of the chord as the bottom note in the left hand. However, feel free just to play the guide tones with either note on the bottom so that you can experiment with different inversions of the upper structure triads. Two handed chords are pretty tough to master in 12 keys, but with some guided effort you can sound just like a professional jazz pianist.